This script will allow you to send the selected objects to UVLayout and get them back. This is useful when you wants to have more than one object in the same UV square. All editable poly objects from the selection(selected objects or groups) will be sent to UVlayout. It's a modified version of Norman "Norman3D" Schaar's script, which is modified version of Robert Fletcher's script. Now you can send to and receive from UVLayout more than one object, not only one, as it is in the previous versions of the script. Idea Zarko Bojkovski. The groups(nested also) are supported. 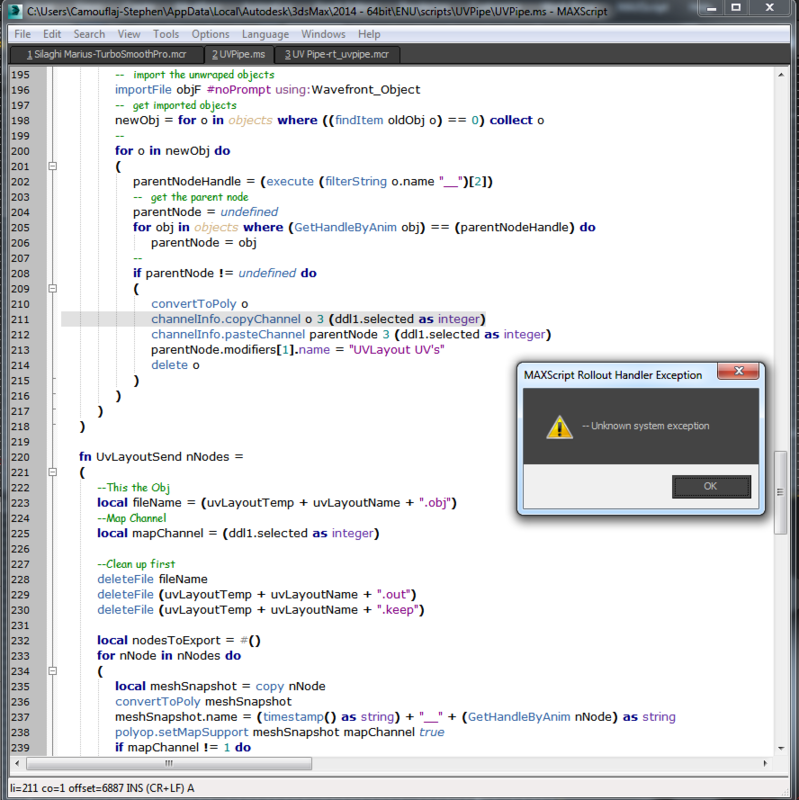 User will now be given the choice to close UVLayout if the object was deleted while editing. Rewrote script to support modifiers and avoid colapssing of the stack. UVPipe will attempt to find uvlayout.exe automatically. Moved creation of temp and config files to User directories to avoid write-errors due to lack of admin rights in restricted environments, typically at work. Rewrote the functions so that no "temp" mesh is left behind in the max scene while editing. Objects with spaces in their names can now be send to UVLayout. Installation: Drag and Drop the UVPipe_mod_by_miauu.mzp file on 3dsMax. A button will be automatically added to the Main Toolbar. Version Requirement: 3ds Max 2008 and up. Thanks for sharing your work with other 3DS users! I hope they will find the script useful. They Guys, Im using 3d Max 2014 and when i use UV Pipe it seems to work with Uv set 1 but Uv Set 2 and 3 Crash when you send the asset back to max. I attached the Script crash. Any Ideas how to fix this? 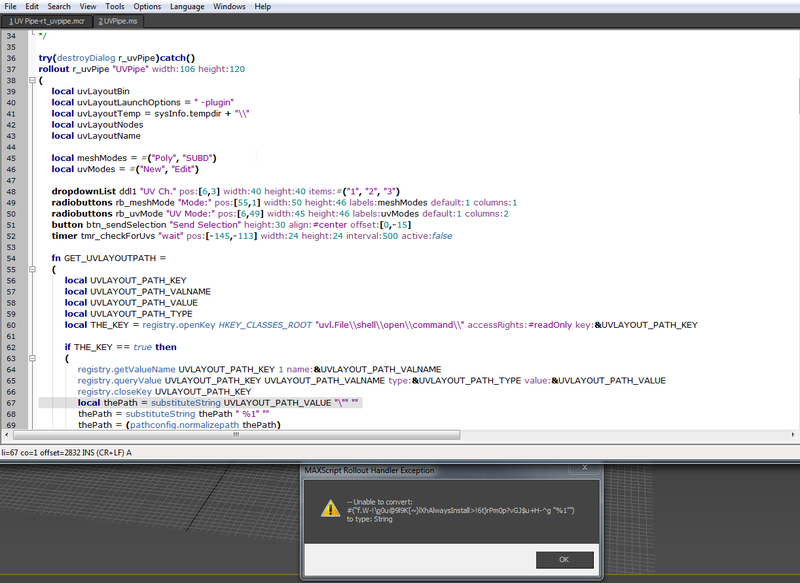 Plugin doesnt seem to want to work with 3dsmax 2015, any help would be appreciated. I am using max 2015 and when I send the uvs back to max they look ok in the uv editor, but if I add a checkerboard pattern to my model they are stretched and squashed all over the place in 3ds max and yet the check pattern in uvlayout is fine. Would love to see this working properly. it will be the difference between me buying headus and not buying. Hi! I use 3ds max 2011 and this plugin, while testing headus. But after I revert (send back) unwrapped model to 3ds max - it is streched, distorted. Only way I managed to do - saving obj from headus. It is not what I expected. Can this be fixed?